This book has been some 15 years in the making and can claim, with some justification, to be the definitive publication on the ‘Recces', unlikely to be topped for many, many years. Unfortunately, due to sales rights restrictions, we cannot offer Recce for sale in your country. This book has been some 15 years in the making and can claim, with some justification, to be the definitive publication on the ‘Recces’, unlikely to be topped for many, many years. The South African Special Forces have invariably been portrayed as a sinister force, used in covert operations locally and abroad, but this is pure political expediency and media propaganda. The unit’s operators are shy, humble soldiers, whose primary role is intelligence-gathering, although they will take offensive action, ruthlessly, if necessary. Highly trained professionals in a class of their own, these elite troops have garnered for themselves an international reputation par excellence. 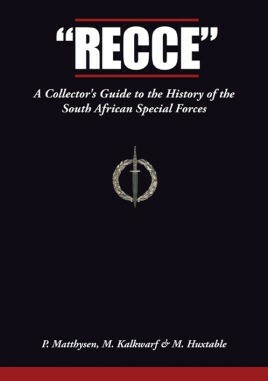 With a foreword by the late Major-General F. W. Loots, this unique book also includes a comprehensive history of the Reconnaissance Regiments and auxiliary units; selection and training processes and techniques; insignia, kit and equipment; honours and awards; memorabilia, memorials and museums and also an amazing 2,500 full-colour images. Paul Matthysen has been researching South African Special Forces since 1991, and lives in Johannesburg. Matthew Kalkwarf lives in Johannesburg and manages his own company. With a keen interest in the military, Michael Huxtable served two years’ national service in the South African Defence Force Intelligence School during 1988/89. Mike lives and works in Johannesburg.